Improve revenue collection with new technologies and options. Our unique bill-bypass feature allows you to continue to collect bills for payment even if the bill validator gets jammed. 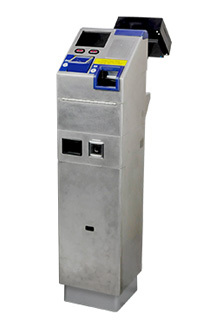 Our coin acceptor can take more than 6 coins at a time — no more dropping one coin at a time into the Farebox. “Talking” farebox meets ADA requirements for the visually impaired Advanced Farebox technology to communicate with your customers enhances acceptance of a new AFC program – and improves the rider’s experience and confidence. For example, our multi lingual “talking Farebox” can provide step by step instructions for using new technology such as a smartcard, including critical information like remaining balance or smart card status. It also beeps in different ways to alert both the passenger and driver that insufficient fare has been collected. To complement the audio, an easy to read, large, full color LCD display communicates text or pictures to passengers. We offer design option such as standalone or integrated smartcard readers – resulting in technology flexibility to meet diverse agency requirements. Fareboxes with integrated smartcard readers save onboard space while still providing all the benefits of smart card technology. We support ISO 14443 Type A and B, and NFC standards. If stand alone readers make more sense, we have a line of them as well, including those for loading platforms and the back door of a bus or light rail vehicle. Drivers like LECIP’s easy to read Operator Control Unit (OCU). Our OCU’s anti-glare, high resolution, color TFT screen offers a state of the art interface for drivers. Programmable keys provide flexibility to meet each agency’s desired requirement. Our OCU even has audio selected information. The OCU also provides an interface to other on board equipment and can support ITS driver display requirements. Our flexible technology will allow the addition of or change over to new, future payment technology – so long-term viability. LECIP uses open industrial standards wherever possible to support integration to other onboard technology and our fare collection solution is capable of processing mobile phone payment using NFC technology.